This Friday night, July 11th will be the date for an exciting night of mixed martial arts action in Las Cruces, New Mexico. 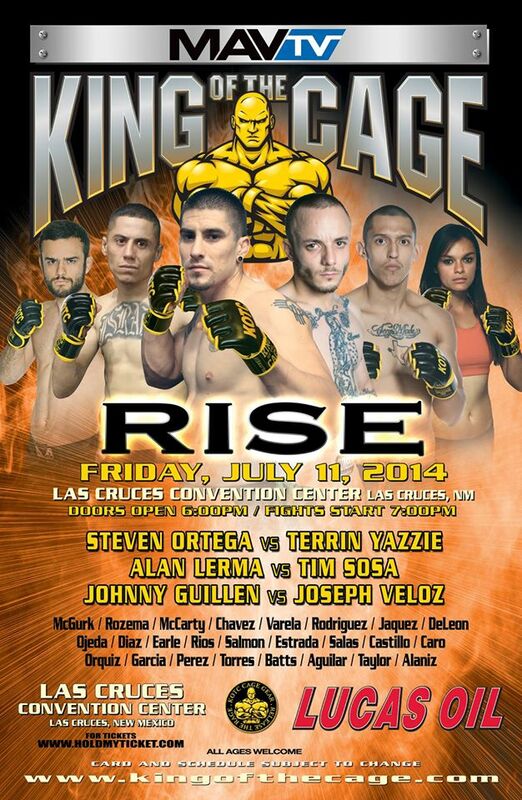 The King of the Cage promotion will take the show on the road and travel to Southern New Mexico for their show titled “Rise” which will be held inside the Las Cruces Convention Center. The event will feature four professional bouts and a lengthy lineup of amateur bouts. The fight card is quite extensive in terms of bringing in talent from all over the region as eight towns and three states will be represented by the fighters included on the fight card. The headlining act will feature the hometown fighter, Steven Ortega and Arizona’s Terrin Yazzie in a Lightweight duel. The co-main event of the evening may be the most anticipated as FIT NHB’s Tim Sosa and Las Cruces Gracie Barra’s Alan Lerma will step into the cage to fight one another for the second time. Back in January, Sosa and Lerma fought for the Rocktagon MMA promotion in El Paso, Texas in a bout that ended in some controversy when Lerma was awarded a split decision victory when it appeared as if Sosa won two of the three rounds. Sosa will have his chance at redemption and Lerma will have the opportunity to solidify the victory and keep him unblemished record intact. The entertaining John Rozema will also be in action on the professional portion of the event, “Rock’em Sock’em” Rozema will bring his talents all the way from Judgement MMA in Rio Rancho, New Mexico to meet up with Red Spider’s Adam McGurk who is noted to be more of a submission savant. The style clash should be one of great intrigue as Rozema has built a reputation for swinging for the knockout in every fight. Rounding out the professional card, an El Paso vs. El Paso pairing between Red Spider’s Johnny Guillen and Get Fit Fight Gym’s Joseph Veloz; both fighters will be making their professional debuts. The amateur card will be full of notable fighters and match-ups as well. The amateur portion of the show will be headlined by one of the premier amateurs in the regional circuit, Cristobal Chavez of 10th Planet Jiu Jitsu El Paso. The undefeated Chavez owns a victory over the current KOTC Amateur Champion Robert Herrera and will take on the very experienced Sammy Mendoza of Carlsbad, New Mexico. Alexander Marshall of Las Cruces Gracie Barra and Anthony DeVargas of J5’s MMA will represent the most experience in an amateur bout as both fighters have seven wins to their name and three losses between them. The middleweights have the potential to be put on the “Fight of the Night” as both athletes are exciting to watch and always look to put on a show for the fans. There will be a WMMA bout amidst the amateur bouts as a Las Cruces vs. Las Cruces match-up between Diana Rodriguez of the Bonecrusher/Torres Fight Team will take on Sandra Jacquez of the KO Club in the 115-pound division. Both women are 1-0 in their young careers and if history can be used as a precedent, WMMA bouts in the KOTC cage always seem to steal the show. The amateur card will feature sixteen bouts; included in the listing is a Heavyweight bout between Frisco Deleon and James Strickland, and KOTC mainstays Hosay Batts, Andy Salas, Mike Aguilar and Fred Rodriguez. Several gyms will be represented on Saturday night, including Transcendence MMA, Get Fit Fight Gym, Desert Dynasty, Extreme Jiu Jitsu and Power Block MMA.